NOW, NOTHING: An indigenous Guatemalan woman examines a corn crop ravaged by the effects of climate change in her country's Corredor Seco (Dry Corridor) region. But what’s lost in Trump’s border-security bluster is that there’s something unusual about this wave of Central American migrants. Most are not from Honduras or El Salvador. Most are instead from Guatemala. And immigrant advocates say the main force driving them to flee here is climate change. Abraham, an indigenous farmer who arrived in Palm Beach County in January, describes the “pow pow” sound of his hand-held hoe hitting dry earth back in Guatemala. After years of drought and erosion, the soil in the western Quiché highlands he hails from is hard as rock – and it no longer produces the crops his family needs to live. 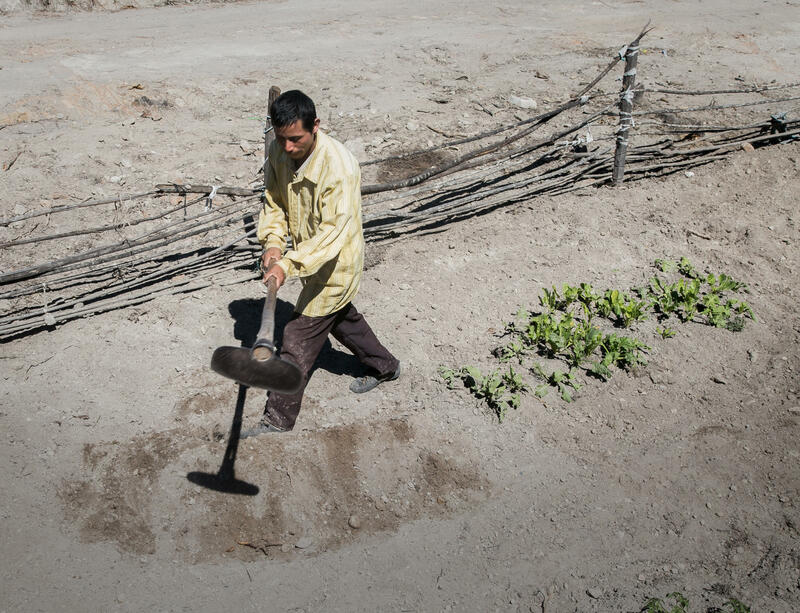 DUST BOWL-STYLE CRISIS: A Guatemalan farmer tries to salvage drought- and erosion-battered soil. So in December – facing starvation – Abraham took his wife and two young boys on a two-week-long trek to the U.S. border. There they asked for asylum. After U.S. immigration officials processed them, they headed for South Florida, to Lake Worth, to join the large indigenous Guatemalan community they’d heard about here. Now they share a two-bedroom apartment with five other Guatemalan migrant families in Riviera Beach. At least his corner of Guatemala, which is part of El Corredor Seco, The Dry Corridor. Scientists say climate change has been hostile to agriculture in that region – so much so that last year farmers there say they lost 90 percent of their crops. At the same time, severely depressed prices for Guatemalan coffee have left those campesinos with little or alternative cash source to buy food. Escalante believes the Guatemalans she’s helping now are part of the world’s new and growing cohort of displaced people: climate change refugees. 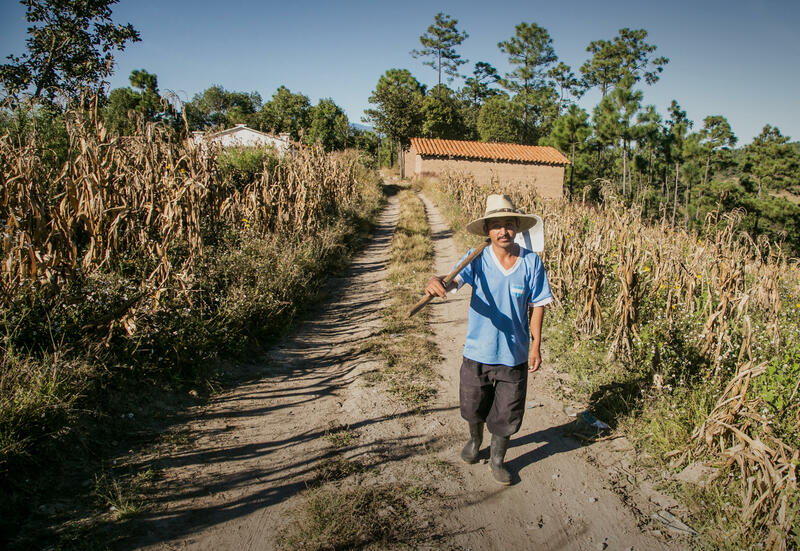 But how has climate change made Guatemala’s Corredor Seco so unsurvivable? What distinguishes this prolonged, dust bowl-style crisis from, say, routine cycles of drought? “It’s the unusual climate volatility,” says Dan McQuillan, agricultural programs manager for the nonprofit Catholic Relief Services and an expert on farming in Guatemala. McQuillan, who spoke with WLRN from his base in Calgary, Canada, says climate change volatility is so damaging because it brings not just temperature rise and drought, but things like erratic bursts of hard rain – even during drought. And that can kill crops not for just a harvest cycle but for years to come. The size of Guatemala's Corredor Seco a decade ago (left) and its estimated size today. As a result, McQuillan thinks Trump’s plan to cut off aid to Guatemala and other Central American countries could backfire – especially since climate change is now causing the Corredor Seco to grow. "It will just increase the pressure for even more people to to migrate,” he says. But there is also legitimate concern that Central American governments don’t use U.S. aid dollars all that effectively. Guatemala’s environment minister, Alfonso Alonzo, told WLRN he has a climate change relief and adaptation program in place. Yet Alonzo, a political crony of right-wing Guatemalan President Jimmy Morales, also admits he has no environmental experience. Guatemalan migrants, meanwhile, say they saw little government help back in their country. Either way, Alonzo argues it’s industrialized countries like the U.S. that emit the most pollutants scientists believe responsible for the global warming behind climate change. ARRIVALS INCREASING: An aid worker (right) from the Guatemalan Maya Center in Lake Worth visits an indigenous Guatemalan migrant family in Palm Beach County. Twenty-year-old Guillermina says it was the prospect of famine that brought her to Lake Worth just a few weeks ago. Guillermina (who also asked WLRN not to use her last name because her own asylum case is pending) is an indigenous Guatemalan woman who lived in Huehuetenango province, now part of the Corredor Seco. Shortly before she left for the U.S. border, her mother died of an illness made worse by malnutrition. Her mother also left a one-year-old baby boy. In Kanjobal, her Maya dialect, Guillermina says she couldn’t leave her baby brother Ronaldo behind. Because Guillermina is not Ronaldo’s mother, U.S. immigration officials couldn’t let her bring him to Lake Worth. (She and relatives are working to get legal clearance for him to join her.) For now, he’s in a crib in El Paso, Texas – one of the youngest climate change refugees in U.S. custody right now. A ONCE PRETTY COUNRY: A Guatemalan farmer walks through a ruined corn crop.